A true breakfast menu classic! Excellent Source: protein, vitamin A, folate, choline and iron. Good Source: vitamin D and calcium. Heat 2 to 3 inches of water in large saucepan or deep skillet to boiling. Adjust heat to keep liquid simmering gently. Break eggs, 1 at a time, into custard cup or saucer. Holding dish close to surface, slip egg into water. Cook eggs until whites are completely set and yolks begin to thicken but are not hard, 3 to 5 minutes. Do not stir. Lift eggs from water with slotted spoon; drain well. Top each muffin half with 1 bacon slice, 1 egg and about 1 1/2 Tbsp hollandaise sauce. Serve immediately. Use very fresh eggs for poaching. They hold their shape better and form fewer wispy threads or "angel wings" in the water. Do not swirl the water when poaching eggs. This creates a vortex that will ruffle the delicate egg protein. Relatively quiet water that is gently simmering produces the best result. 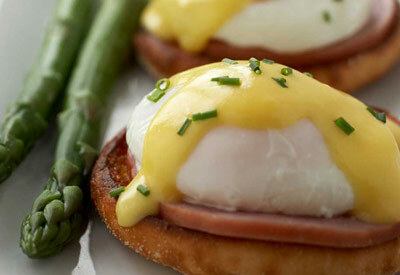 Do not poach eggs ahead of time and hold them in the refrigerator. Save $1.50 on ONE Tampax Pearl, Radiant OR Pure Clean Tampons (16 ct or higher).